We met with the homeowners in Westerville. They had an old deck that had seen better days. We asked them about what their wants and needs would be in a new outdoor living space. 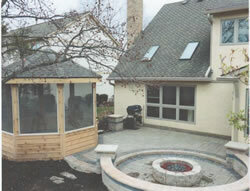 They wanted a screen room attached to their house and a low maintenance paver patio. They also wanted a fire pit but did not want the smoke of a natural fire. After looking at the roof line of the house we decided that there was no good way to attach the screen room to the house. With a small yard, Creative Earthscapes had to design an outdoor living space with all the wants the client needed into a small space. There was also a Maple tree the client's loved and wanted to keep in the design. We came up with a multi-tiered design using Unilock Beacon Hill Flagstone paver with a Series 3000 soldier (edging paver for contrast placed perpendicular to the edge) and Copthorne sailor (edging paver for contrast placed parallel to the edge). The patio has 2 exits into the yard. The patio steps down to a rounded fire pit area and steps up into a beautiful cedar gazebo. 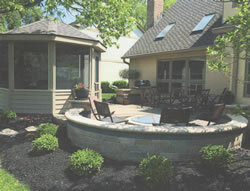 The fire pit addresses the clients smoke concerns with a gas fire pit. Creative Earthscapes had a gas line installed from the house to the fire pit. The fire pit is made out of Brussels Dimensional small topper in a Sierra color. Fire pit is 12" tall. Creative Earthscapes installed a rounded seating wall anchored by 2 pillars built out of Brussels Dimensional Stone Sierra with a charcoal Series 3000 band through the wall to accent the patio. The 20" tall seating wall is capped with Brussels Classic bullnose and the 28" tall pillars are capped off with Unilock Ledgestone pillar caps. Creative Earthscapes found a perfect spot for the gazebo nestled between the patio, house, and grand tree. 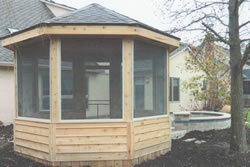 The gazebo is built out of red western cedar complete with siding, trim, skirting, and fascia. The octagon gazebo floor matches the patio with the Beacon Hill Flagstone paver. The inside walls are bead board, premium removable screens are used, and a rough sawed ceiling. Creative Earthscapes had a ceiling fan installed for those hot days in July. 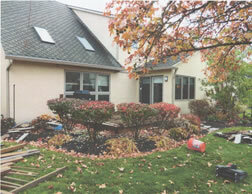 The client asked for a low maintenance landscape plan and black hardwood mulch to match their existing landscaping. We chose boxwoods along with some lotus and other perennials to complete the landscaping and the project.